M.Ch - Urology, MS - General Surgery, M.B.B.S. Dr. Rajiv is an alumnus of prestigious institute S.M.S Medical College, Jaipur from where he completed his basic medical studies (MBBS). Thereafter, he pursued his post graduation in General Surgery from S.P. Medical College, Bikaner. Subsequently, he worked as a fellow in the department of Renal & Hepatobiliary Transplant at Apollo Indraprastha Hospital, New Delhi. After pursuing this for a year, he worked as a senior resident in the department of General Surgery at the Government Medical College & Hospital, Sector 32, Chandigarh. Thenceforth, he served as Senior resident in the department of Urology at Sanjay Gandhi Postgraduate Institute of Medical Sciences, Lucknow. Alongside he accomplished his super specialization, M.Ch (Urology) from the same institute. After achieving his super specialization, he practiced in various hospitals in Tri-city and established department of Urology in many of them. For last eight years, he has been associated with Mukat Hospital, Chandigarh. 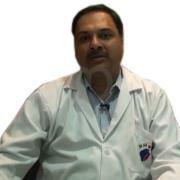 Dr. Rajiv has rich experience in the domain of Urology & Andrology. Dr. Rajiv has attended various conferences and CMEs at a national & international level and delivered many orations & lectures on various Urological diseases. Besides, he has contributed his research work to various peer-reviewed journals .